The drawing Hemorrhage is inspired by the Lakeview Gusher which occurred in Kern County, California from March 1910 to September 1911. This oil well created the largest accidental spill in history and released 9 million barrels of oil into the landscape. 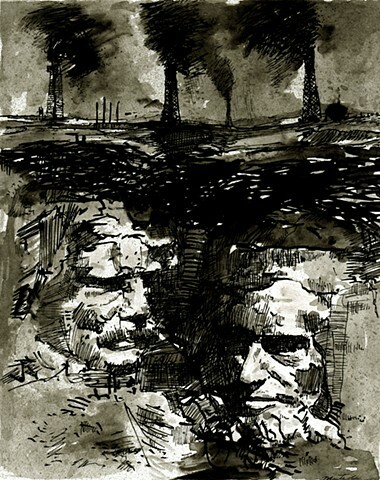 The oil wells at the top of the drawing represent the “blowout” events where an uncontrolled release of oil occurs, hemorrhaging out over the earth and spraying up into the sky. The black ink flows down the page and envelopes the figures of Roosevelt and Lincoln at the bottom. On Mount Rushmore, Lincoln symbolizes the permanent union of the states and equality of all citizens and Roosevelt symbolizes the role in world affairs and industrial growth of the nation. Hemorrhage represents the uncontrolled darkness flowing over the principles of liberty and freedom as inspired by environmental catastrophe. This darkness is the erosion of equality that Lincoln represents in an unending quest for growth and power.